With rare exceptions, men’s belts have closed the same way since King George VI was a little boy and his older brother, Edward, was destined to sit upon the throne of England and reign, as was his duty, until he passed on. The future seemed solid, sure, as did belt buckles. However, at that time no one had much heard of Bessie Wallis Warfield, born on the Maryland/Pennsylvania state line in 1896. The closure—banish the buckle, it’s so pedestrian—on the mahogany belt pictured here is an actual main halyard shackle from a sailboat. It was designed to attach to the top of the mainsail. The pin screws into the lower part of the shackle. There is no other belt like it in the world. If you rummage about in the darkened recesses of your mind, back where your unremembered dreams are archived, you will realize you have never seen a belt like this before. And you will be correct. 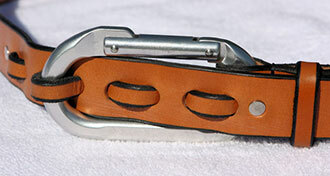 The Light Havana belt closure pictured is an aluminum mountain climbing carabiner. Climbers on Everest and K-2 bet their lives on identical devices. You’ll just have to bet your modesty. These carabiners will never let you down. 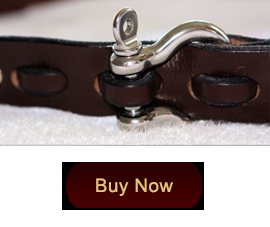 Our belts are 1-1/4” wide and come in two colors, Light Havana and Mahogany. Light Havana looks stunningly superior with jeans. Mahogany stands out smartly with khakis. Along the waterfront, where people know sailboats and appreciate the nuances of sailing and the knowledge it takes to harness the wind successfully, the mahogany belt with a shackle closure will stop the cognoscenti cold. Where climbers meet, belts with carabiner closures will tie them into knots. Hang them in your closet, if you can stop using them, and your closet will take on the scintillating scent of rich leather. It makes you inhale deeply, as if in the backwind of a lovely passing woman wearing a perfume laden with the essence of dreams come true. The shackle and carabiner belts come in standard belt sizes, with emphasis on 34, 36 and 38. 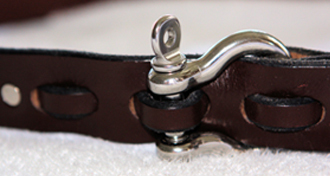 The loops allow you to make your belt either larger or smaller in 1-1/2” increments. We can supply larger or smaller belts on special order. They don’t cost more, but they take a little longer because they are custom made to your specific requirements. If you are wondering about Bessie Wallis Warfield, she was woman enough, though twice-married, to cause King Edward VIII of Great Britain to give up this throne to marry her. When he did so, she became the Duchess of Windsor. Addendum: The shackle belt will also accept the genuine mountain climbing carabiner. In fact, for a small extra charge, you can have both closures. Don’t try to put both closures through the loop at the same time. We know you’re smarter than that.